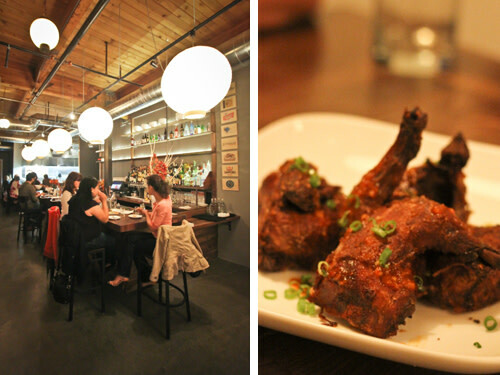 Welcome to SE Division street's latest hangout, Wafu; a 21st century ramen house with hot design details and menu surprises from Portland's seafoodiest chef. 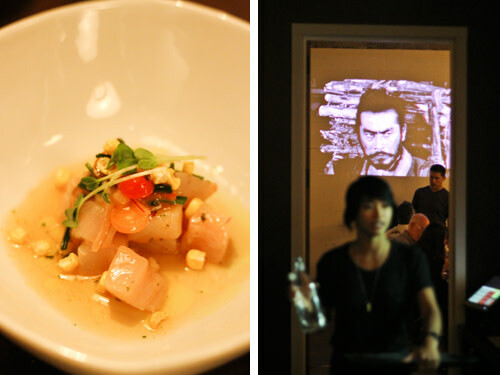 Trent Pierce’s new restaurant, Wafu (translation: Japanese Style), is officially open to the public, and it tastes a lot more like his last restaurant than you might expect. It may be that the new Japanese small-plate menu carries over a few favorites from the shuttered seafood-heavy Fin, but the true deja vu here is the remarkable quality of the ingredients, from the fresh prawns for Wafu’s addictive shrimp tempura to the small hens for the "KFC", Pierce’s take on spicy fried chicken. While it does feel as though the restaurant’s designers put all of their energy into the back half of the long and narrow building (leaving a rather stark entryway and sparse front-of-the-house dining room), the effect creates at least four distinct areas to accommodate several kinds of diners and imbibers. For the saké tipplers and whisky sippers, seats lining the bar give a front-row view of Wafu’s Japanese and domestic drink selection, the chef’s bar provides a behind-the-scenes look at the makings of great grilled flavors and savory bowls of ramen, and a back room—complete with a projection screen showing old-school Japanese films—provides a more intimate experience. It’s obvious that Pierce is having fun with Wafu’s menu, and he’s not afraid to make the kind of food he wants to eat. 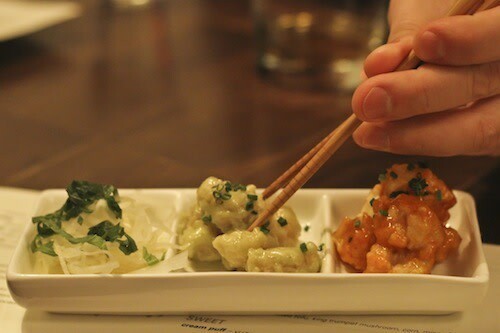 The menu is grouped into hot plates, cold plates, and ramen—and everything is meant to be shared. Prices vary pretty dramatically according to plate size—from $3 snacks like house pickled sunamono, three kinds of onigiri, and edamame (with sichuan salt, togarashi, garlic and soy) to the $14 plate of a whole fried chicken--giving diners the option to grab a single snack or dive into a whole meal. 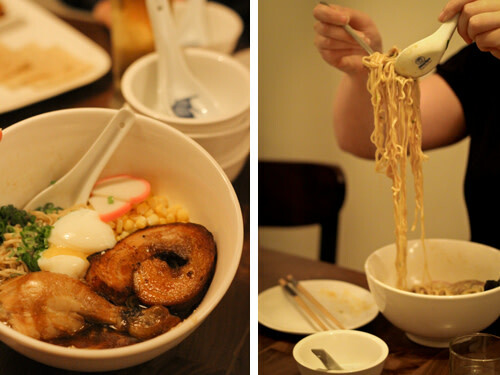 Yes, the ramen is fantastic—savory, rich, and full of customizable add-ons like pork belly, poached eggs, and chicken legs—but the menu doesn’t stop there. The whole menu currently has just 16 options, making it completely feasible to bring a few friends and order everything on it to get a true taste for Chef Pierce’s high-quality flavor exploration. 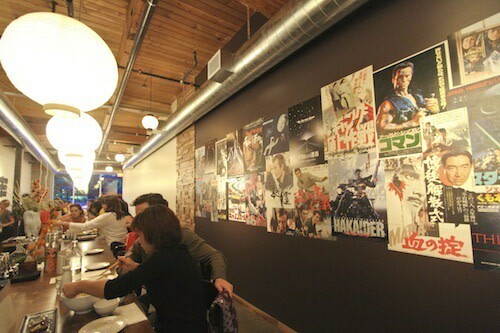 The wall alongside Wafu’s bar is lined with Japanese movie posters, adding a pop of color and action to the long and narrow restaurant. 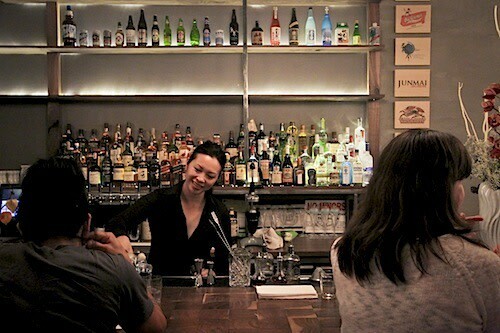 Diners at the bar can order off the full menu, making it the ideal stop for a bowl of ramen and a wide variety of Japanese beers. Choose between three kinds of ramen: Miso ramen with garlic oil, "Vege" ramen with marinated tofu, king trumpet mushrooms, and miso, or Wafu’s signature ramen (picutred here) with sweet corn, scallion, kamaboko, and smoked schmaltz. You can add pork belly, a slow poached egg, smoked chicken thighs, or red dragon sauce for a few bucks more. 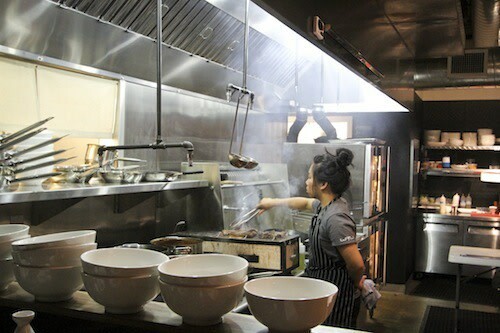 Sit at the kitchen counter behind bowls of ramen waiting to be filled and catch a glimpse of grills, pans, and knives in action. Wafu’s KFC is a whole smokey chicken ($14) with scallions and "red dragon sauce", a flavorful concoction of Calabrian chiles, garlic, olive oil, and fish sauce. Wafu’s tempura shrimp ($7) comes drenched in two powerful sauces, a creamy, spicy chile garlic sauce and wasabi mayo, with a side of daikon radish and shiso salad. The sauce adds a lot of flavor but the shrimp stay crunchy—a true feat of frying success. 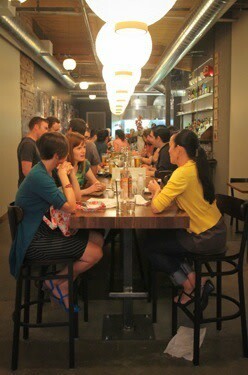 Snag the end of Wafu’s long, lantern-lit table for the perfect sharing space for groups large and small. 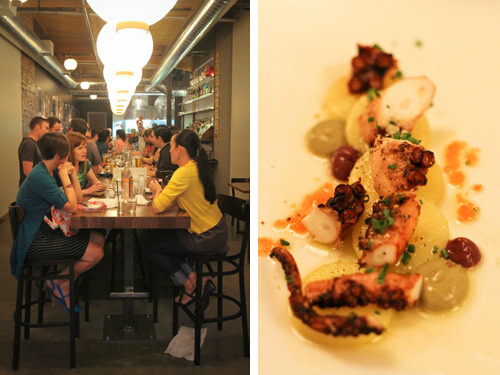 If you’re a fan of tentacles, snag a plate of barbequed octopus, with decadent confit potatoes, mentaiko (marinated cod roe), and two kinds of olive cream ($9). Wafu’s cocktails are carefully prepared using "Japanese-style" bartending, including signature shaking techniques, intricate ice carvings and delicate fruit garnishes influenced by the art forms of sushi making and Japanese tea ceremony. Grab a seat at the bar for a front row seat of the action. While classic black-and-white Japanese movies play overhead in the back dining room, Chef Pierce’s signature ceviche—a holdout from Fin’s menu—provides a colorful kick with fresh Mahi Mahi, tomato, corn, Calabrian chiles, cilantro, and mint ($10).